Although he could hold his own as a solo artist, Chet’s biggest contributions came as a sessions musician. Let’s just say he played well with others. 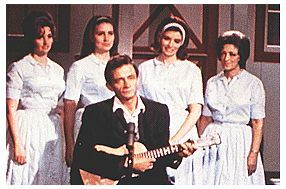 In fact, those who he recorded and jammed with often took their cues from the great picker, and many went on to become number one hit artists themselves. Maybe the most well-known of the Carter Sisters is June Carter Cash. Wife of Johnny Cash, but first and foremost daughter to Maybelle Carter. Maybelle started singing in the 1920s, but formed the Carter Sisters during World War II with her daughters Helen, Anita and June. They gained more notoriety after signing-on with the Grand Ole’ Opry in Nashville, Tennessee for a 10-year stint. Within those walls, they sang and played with country stars like Chet Atkins, Waylon Jennings, Elvis Presley and Ernest Tubb on national TV. Mammas Don’t Let Your Babies Grow Up To Be Cowboys was a product of the “Nashville Sound” that Chet introduced. His contemporary and good buddy, Waylon Jennings’ was known as the “gun-toting, Texan tough guy of country” while Chet was the industry’s “Country Gentleman”, the two had a mutual respect through their love of Country music. They both began playing guitar before the age of ten and knew early on that their life was going to be about music. 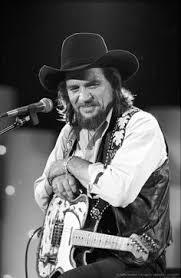 Waylon’s authentic, deep voice brought the “sound” one step closer to where it is today. Jennings and Atkins collaborated at times on projects after Chet recruited him to sign with RCA Records. Another mega star to sign with RCA while Chet was at the helm was this gifted young man from Sledge, Mississippi. Like Chet and many of his contemporaries, Charley was just a kid when he bought his first guitar and learned from listening to his favorites on country radio. Shortly after signing with RCA, Pride brought home his first of several number one hit “Just Between You and Me”. 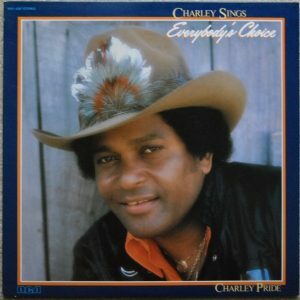 Charley Pride became the most lucrative performer that Chet had in his line-up of stars since Elvis Presley. Chet was a positive force in the Country Music arena. He was a humble man and it’s rumored that he found something to like about anyone he met. For sure, he knew talent when he heard it and encouraged up-and-coming artists to persevere and follow their dreams. From then until now, the music business has changed drastically. Money is the number one game in town and the competition is fierce. I wonder if Chet would recognize the industry he loved so much. One thing for sure, he would still be a country gentleman, no matter what.